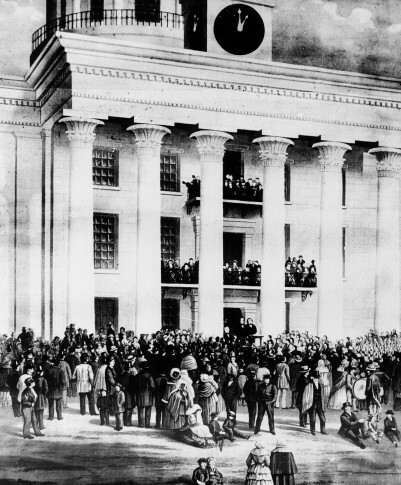 In 1861, Jefferson Davis was elected provisional president of the Confederate States of America at a congress held in Montgomery, Alabama. Today is Saturday, Feb. 9, the 40th day of 2019. On Feb. 9, 1964, The Beatles made their first live American television appearance on “The Ed Sullivan Show,” broadcast from New York on CBS. In 1825, the House of Representatives elected John Quincy Adams president after no candidate received a majority of electoral votes. In 1942, the U.S. Joint Chiefs of Staff held its first formal meeting to coordinate military strategy during World War II. Daylight-saving “War Time” went into effect in the United States, with clocks moved one hour forward. The SS Normandie, a former French liner being refitted for the U.S. Navy at a New York pier, caught fire (it capsized early the next morning). In 1943, the World War II battle of Guadalcanal in the southwest Pacific ended with an Allied victory over Japanese forces. In 1950, in a speech in Wheeling, West Virginia, Sen. Joseph McCarthy, R-Wis., charged that the State Department was riddled with Communists. In 1964, the G.I. Joe action figure was introduced at the American International Toy Fair in New York. In 1971, a magnitude 6.6 earthquake in California’s San Fernando Valley claimed 65 lives. The crew of Apollo 14 returned to Earth after man’s third landing on the moon. In 1984, Soviet leader Yuri V. Andropov, 69, died 15 months after succeeding Leonid Brezhnev; he was followed by Konstantin U. Chernenko (chehr-NYEN’-koh). In 2002, Britain’s Princess Margaret, sister of Queen Elizabeth II, died in London at age 71. In 2005, Hewlett-Packard Co. chief executive Carly Fiorina was forced out by board members, ending her nearly six-year reign. In 2017, a federal appeals court refused to reinstate President Donald Trump’s ban on travelers from seven predominantly Muslim nations, unanimously rejecting the administration’s claim of presidential authority, questioning its motives and concluding that the order was unlikely to survive legal challenges. Ten years ago: President Barack Obama used his first news conference since taking office to urgently pressure lawmakers to approve a massive economic recovery bill. New York Yankees third baseman Alex Rodriguez admitted to taking performance-enhancing drugs, telling ESPN he’d used banned substances while with the Texas Rangers for three years. Lindsey Vonn won the downhill for her second gold at the World Championships in Val D’isere, France, becoming the second American woman (after Andrea Mead Lawrence) to win two golds at a worlds. Playwright Robert Anderson (“Tea and Sympathy”) died in New York at age 91. Five years ago: Despite a wave of online protests, Copenhagen Zoo in Denmark killed a healthy male giraffe named “Marius” because of rules imposed by a European zoo association to deter inbreeding. Host country Russia won its first gold medal of the Sochi Olympics, winning the team figure skating event; Matthias Mayer of Austria won the men’s downhill. Missouri All-American Michael Sam came out to the nation as an openly gay player in published interviews with ESPN, The New York Times and Outsports. Danish movie director Gabriel Axel (“Babette’s Feast”) died in Copenhagen at age 95. One year ago: President Donald Trump signed a $400 billion budget deal that sharply boosted spending, swelling the federal deficit; the measure ended a brief overnight federal government shutdown. At the opening ceremony of the Winter Olympics in South Korea, North and South Korean athletes entered Olympic Stadium together, waving flags showing a unified Korea; it was their first joint Olympic march in more than a decade.